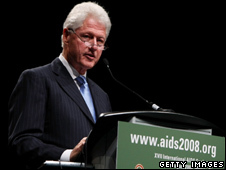 Former US President Bill Clinton has called for an increase in funding to keep down the cost of drugs for people with HIV. Mr Clinton told a world Aids conference in Mexico that a 50% rise was needed in the next two years just to keep pace with expanding drug programmes. Figures released ahead of the meeting show the number of people with HIV worldwide has decreased slightly. However, infection rates are still rising in some countries. Across the world 33 million people are affected by the syndrome. "Aids is a very big dragon. The mythological dragon was slain by Saint George, the original knight in shining armour, but this dragon must be slain by millions and millions of foot soldiers," Mr Clinton told the conference. 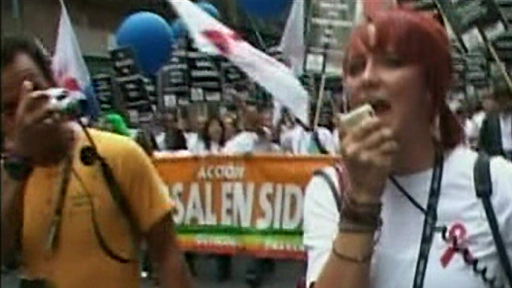 A crowd of demonstrators holding banners calling for housing for people with HIV walked in front of the podium during his speech. Mr Clinton used the moment to talk about how rising oil, food prices and the mortgage crisis had made the lives of people with HIV even more difficult. There was "no silver bullet" to rid the world of the disease, he said. "We know there is so much yet to be done: to expand prevention, treatment and care, to strengthen undeveloped health systems," he added. The six-day conference was preceded by an awareness march, a photo exhibition and other events. About 20,000 scientists, government officials and campaigners are in Mexico City for the event. Funding, access to treatment, improving prevention against HIV and social issues such as stigma and violence against women are all on the agenda. However delegates are not expecting any breakthrough announcement concerning new drugs or the search for a preventative vaccine. The UN General Assembly and the Group of Eight (G8) have set the goal of achieving universal access to treatment and therapy by 2010. Since Aids first became widely known, a quarter of a century ago, 25 million people have died. In one positive development, US President George W Bush recently won backing to triple US spending on combating the syndrome. But in some countries like Russia and China, and even Germany and the UK, the rates of infection are rising, the BBC's Duncan Kennedy reports from Mexico City. In the US, better detection methods have just shown the figures there have been underestimated by about 30%. And in Africa, home to 70% of cases, access to the right drugs is improving but there are not enough health care workers to administer them. There are concerns too about the human rights of sufferers who are often too scared to seek treatment.